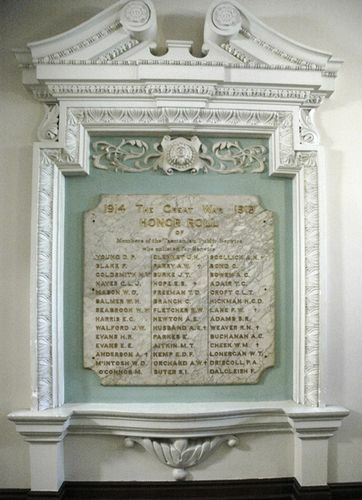 Honour roll commemorates Tasmanian public servants who enlisted for service in World War One. The Governor today unveiled an honour roll in two tablets---one fixed on either side of the vestibule at the entrance to the public buildings, Macquarie Street, in commemoration of the members of the Tasmanian Public Service who enlisted in the A.I.F. The tablets are of marble, the names being cut in the stone and gold lettered, presenting a very handsome appearance The Premier and his colleagues in the Ministry, military personnel, numerous heads of departments in the service, and many other public servants and relatives of soldiers, were present. The roll contains 86 names. Examiner (Launceston) 30th January 1920.